I read quite a few business books, and over the years I’ve found that there’s a common denominator in the ones that stick with me. These are the books in which the author digs deep, gets personal, and shares what’s really worked and what hasn’t. Sheri McConnell’s latest book, Smart Women Know Their Why: The Guide for Discovering Your Life Purpose While Owning a Business So You Can Create Positive Change In the World (and Make Big Profits!, is just such a book. Sheri understands that without an undergirding purpose and a passion for service, entrepreneurs can create a business that is just another job. Purpose is your reason for being at the time and place you are in this world; passion is what carries you through life’s challenges; and a business is the vehicle that helps you share your purpose with others. Sheri walks readers through the process of discovering life purpose and teaches how to think entrepreneurially and create a business that fulfills that purpose. What makes Smart Women Know Their Why different from many “purpose” books is that Sheri unapologetically believes that profit is good, because it helps individuals share their purpose and passion with others. What makes it different from many other business books is that it’s purpose-focused, and written by a mom who has built a seven-figure business from the ground up, working from home. Throughout the book, Sheri shares her personal journey– an amazing story of transformation that will strip away any excuses you might have for not being able to succeed. I have observed Sheri’s journey over the past few years. From her very first little e-mail newsletter for women writers, Sheri has focused on creating something that would help other women grow and succeed. Smart Women Know Their Why fulfills that purpose–I recommend it. 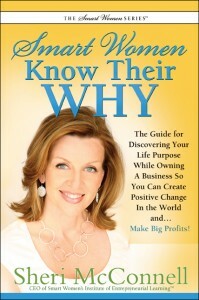 You can read two sample chapters and order Smart Women Know Their Why at http://www.smartwomenwhy.com.